What is a Job Offer Letter? A job offer letter is a document used by an employer to confirm they are offering a specific job to a prospective employee. A job offer letter is a document used by an employer to confirm they are offering a specific job to a prospective employee. While the prospective employee may receive the offer in-person or over the phone, the job offer letter is a formal record of the job offer and can be filed accordingly. The employment offer letter confirms the details of the employment relationship, which helps to prevent confusion. A formal job offer letter should include specific details about the job. This includes the job title, employing company, annual salary, starting date, insurance benefits, retirement accounts, and more. This will provide the prospective employee with all the information they need before accepting the position. The recipient of the letter can accept the job offer by signing the letter and returning it to the hiring manager/supervisor. A job offer letter is typically sent before contingencies like drug and background checks. An offer letter typically provides a brief overview of the position and the company. It lets the new employee know specific details of the position, such as job title, starting date, annual base salary, work schedule, and benefits. There is no standard format for a job offer letter template, but we recommend that you include the following components. 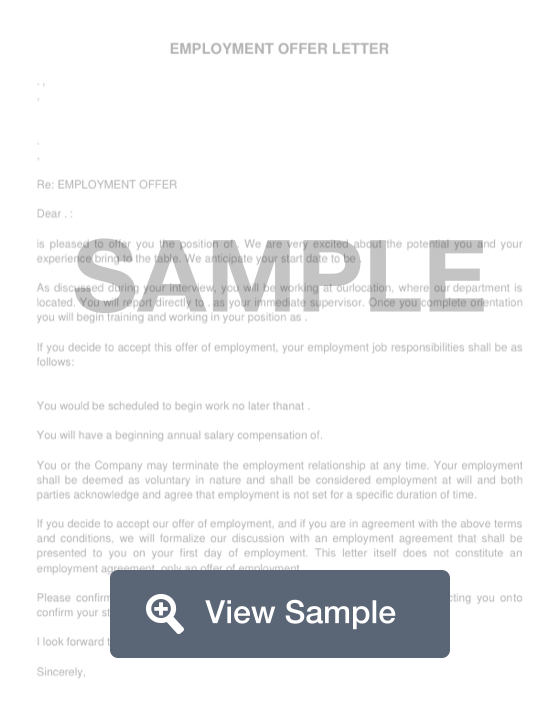 Create a free Job Offer Letter in minutes with our professional document builder. While you may choose to let the candidate know that they have a job offer in person or over the phone, it’s always a good idea to have a formal written confirmation of the offer so that both parties are clear about the terms of the employment. ABC Company is very pleased to offer you the position of Assistant Account Executive in our Sales Department. Your background and skills make you an ideal fit for our sales team. Your starting date will be November 1, 2018. The starting salary is $35,000 per year paid on a biweekly basis by direct deposit. You will also be paid a 10% commission on all sales. ABC Company provides full medical coverage through our employee benefit plan. You coverage will begin on December 1, 2018. You will receive two weeks paid vacation per year along with five days for personal or sick leave. Your eligibility for the company retirement plan will begin 90 days after your start date. This offer of employment is contingent on you passing a pre-employment drug test and background check and signing confidentiality agreements. If you choose to accept this job offer, please sign and return this letter at your earliest convenience. Once your acceptance has been received we will send you information about scheduling your drug test. Sending a job offer email is the quickest way to communicate the important details of a job offer. If you choose to extend a job offer via email, it’s a good practice to call them to let them know about the offer as well. An email job offer should have a descriptive subject line that lets the candidate know that the email contains a job offer. Your email job offer letter can include attachments that the candidate may need to know before accepting the offer. You may choose to include information about company policies and benefits or the employee handbook. You can choose to send the offer letter as an attachment or in the body of the email. If you choose to send the offer letter as an attachment, your email will be brief. Your email will simply congratulate the candidate and explain that the job offer is attached. Congratulations on receiving a job offer from ABC Company. We are pleased to offer you a position as an Assistant Buyer in our Sales Department. The detailed offer letter is attached. If you choose to accept, please sign, scan, and return the letter to me at jonathansmith@abccompany.com by October 10, 2018. We are looking forward to hearing from you and hope you decide to join our team. If you are offered a job, you have several option: you can accept immediately, take a short time to consider, negotiate the offer, or decline. 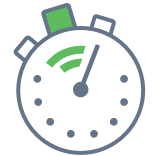 If you need time to evaluate the job offer, let the company know that you need time. Ideally, let the company know within a few business days. If you take too long to respond to the job offer, the company may think that you are not interested, and move on to another candidate. If the job offer is contingent on you completing tasks, make sure that you can complete them before accepting. There are many reasons to turn down a job offer. Before officially turning an offer down, consider whether you can negotiate better terms. If the salary is too low, can you negotiate a better salary? Does the job schedule fit in with your life outside work? If not, is it possible to modify the schedule or would the company consider allowing you to work remotely? If you decide that the company is not a good fit, do it politely and professionally with a formal letter. Be sure to thank the interviewers for the opportunity. You may also choose to include a brief explanation as to why you turned down the offer.